Sound Transit didn’t budget for an expensive Ballard tunnel in its latest ST3 light-rail proposal, but elected officials are keeping that option open. On Seattle’s Beacon Hill, people can descend by elevator, walk beneath sculptures of space creatures, and catch a speedy light-rail train downtown. On Capitol Hill and at the University of Washington, the new transit tunnel already carries 30,000 passengers a day. A four-mile tunnel is being built from Husky Stadium to the future Northgate Station, and digging just began in downtown Bellevue. • Elevated trackway over the median on Elliott/15th Avenue West. 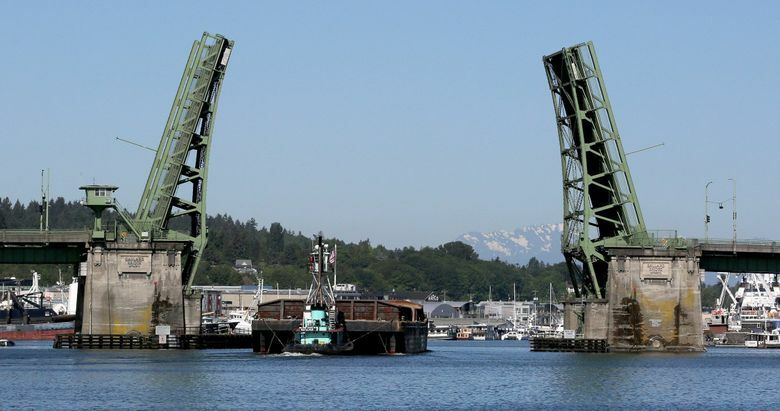 • A 70-foot-high drawbridge next to the Ballard road bridge. • Station over the intersection of 15th Avenue Northwest at Northwest Market Street. • Elevated trackway that crosses from Elliott over the BNSF Railway Yard, to bend north above 20th Avenue West. • A shallow Interbay Station near 20th and Dravus. • Tunnel beneath Salmon Bay, into Ballard. • Tracks curve east, into an underground station in Ballard. A coalition of residents and some politicians have been pushing for a light-rail tunnel under Salmon Bay — at a cost of $450 million — and may continue to do so, even though the Sound Transit 3 ballot measure this fall is expected to instead offer a less-expensive drawbridge. But transit-board Chairman Dow Constantine is leaving the tunnel as a possibility to be explored after the election. Sound Transit’s choice of a drawbridge, confirmed in last week’s ST3 ballot-plan update from CEO Peter Rogoff, isn’t legally binding. The agency describes the elevated corridor above 15th Avenue West as a “representative alignment.” That means the ST3 package would provide enough money for a 70-foot-high bridge in 2035, not a tunnel. So the debate could go on for some time. The main argument for a tunnel is that light-rail passengers would avoid being delayed by a predicted four bridge openings a day to let tall boats pass. “You know that the bridge isn’t going to open, you’re not going to find yourself stuck in traffic,” said City Councilmember Sally Bagshaw, whose district includes nearby Magnolia. The prime drawback of tunneling is the $450 million cost — equivalent to adding two miles of elevated trackway, theoretically enough to continue to Crown Hill or spend elsewhere. “There’s a tension between the quality of service on any particular line, and how many lines you can build,” said former Mayor Mike McGinn, a longtime Ballard light-rail advocate, who says he hasn’t take a position on the tunnel-drawspan debate. Even without a tunnel, the $54 billion regional package would cost an average household $400 per year, if voters in urban Snohomish, King and Pierce counties say yes in November to property, sales and car-tab tax hikes to add 62 miles of rail, plus bus and parking facilities. A tunnel might take additional time to design and build. On the other hand, an 8-foot diameter sewer tunnel was bored under Salmon Bay three years ago. That success suggests Sound Transit wouldn’t repeat the crisis at Portage Bay, where in 1999 boulders were discovered in soft soil, the cost increased by $1 billion, and the light-rail tunnel path to the University of Washington was moved beneath sturdier Montlake Cut. Politically, transit leaders might risk a sort of underground arms race. 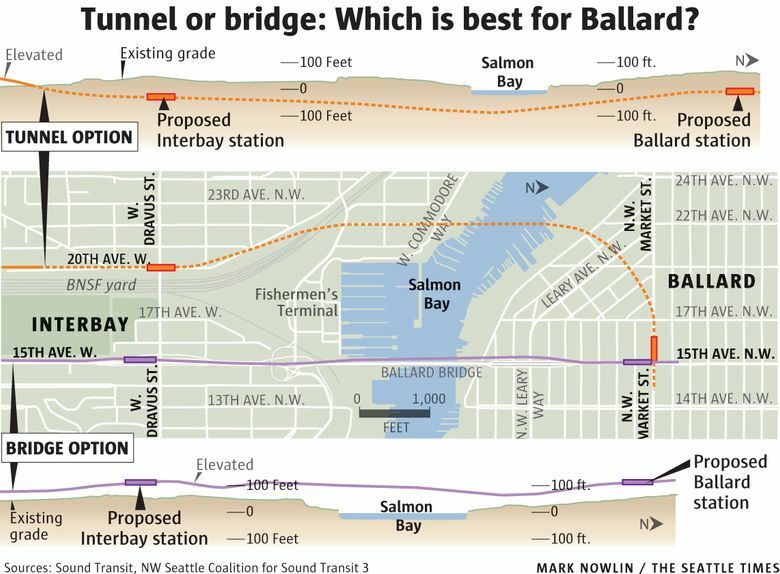 If a tunnel is promised to Ballard, requests are inevitable from West Seattle, which has a steeper slope, and narrower rights of way to cram in a 22-foot overhead track from the Nucor Steel mill to The Junction. “We know that the tunnel is likely going to be more expensive and probably take longer to build, but there’s still a lot of interest,” Councilmember Mike O’Brien, who represents Ballard, said in May 17 committee session. In a later interview, O’Brien said he doesn’t see much public appetite, following voter approval of the $930 million Move Seattle levy, for a Seattle-only tax to pay for a tunnel. City Councilmember Rob Johnson, who is on the transit board, said city officials are also thinking about an idea suggested in the past by Mayor Ed Murray — that Sound Transit contribute to a Ballard bridge that would carry not just light rail, but also cars, bikes and pedestrians. Amanda Kay Helmick, co-founder of the West Seattle Transportation Coalition, said her side of town is just grateful to be considered for rail, in 2030. They’re fighting to catch up politically with the Ballard-South Lake Union corridor, which has undergone $2.8 million in route studies, started under McGinn. That way, tracks could still cross a fixed Duwamish River bridge, to an elevated Delridge Station as proposed, but then plunge underground for a mile or so. Already, the ST3 plan includes an east-downtown tunnel, to add capacity for the whole region. The tunnel-boring machines would likely start their work near Stadium Station and go all the way to Uptown, where elevated tracks would emerge to Interbay. One possible place to find money for a tunnel would be scrapping one of two currently proposed South Lake Union stations, to save $300 million. They’re proposed only a few blocks apart, at the Denny-Westlake crossing and the Harrison-Aurora crossing. Sound Transit originally mapped just one, but the city of Seattle requested both, in a letter last July from transportation director Scott Kubly. But support for scaling back appears nil, and elected officials say SLU is becoming so crowded that it needs both stations. A drawspan would delay trains. Sound Transit’s proposed 70-foot-high train-only bridge wouldn’t open as often as the 44-foot Ballard road bridge, which averages 12 daily openings. A light-rail drawbridge could be expected to open twice a day in winter and four times a day in summer, on average, said Karen Kitsis, project planning director. The North Seattle Industrial Association’s president, Eugene Wasserman, predicts as many as six daily openings. Most are for tall-masted sailboats, but working ships also need high clearances. Three dry-docks east of Ballard would probably generate 150 to 200 openings per year for clients’ boats 70 feet or taller, said Hobie Stebbins, operations manager at Lake Union Drydock. Trains likely wouldn’t be interrupted from 7 to 9 a.m. or 4 to 6 p.m., when road drawbridges already stay lowered. When they open, Seattle drawbridges require four minutes on average — brief enough for light-rail dispatchers, with trains arriving every six to 10 minutes, to perhaps coordinate passage with bridge tenders. Trains can resume service from nearby stations immediately, unlike car drivers who must wait for vehicles ahead. Ben Broesamle, coordinator for the Northwest Seattle Coalition for Sound Transit 3, says that even more than the frequency of span openings, a greater concern is that sooner or later, a mechanical failure would stop train service for hours. “Our view is, the risk of a blockage is unacceptable,” he said. Broesamle echoes the view of young adults that decades from now, a tunnel would flow gracefully into a potential Sound Transit 4 crosstown tunnel, from Ballard to the University District. This is because excavation would occur west of 15th Avenue, then curve so a Ballard Station would be oriented east-west. Another reason to tunnel is that 50,000 cars, trucks and buses would be delayed on 15th because construction cranes or gantries to build an elevated line would block some lanes for up to two years, said Wasserman. Jeanne Kohl-Welles, a County Council member from northwest Seattle, said last week’s plan tweaks by Sound Transit are good news for Ballard overall. The overall timeline was accelerated three years, to 2035 in Ballard and 2030 in West Seattle; the board heeded the local outcry to separate all ST3 trackways from road traffic; and the door remains open to discuss tunneling, which she still favors. And she’s familiar with debates over the visual impact of aerial trackways, from her tenure on the unbuilt Seattle Monorail Project in the early 2000s. Kohl-Welles wants to see the finance plan, and wants to understand community sentiment about other issues, such as whether tracks could continue north. “There are a lot of elements,” she said. Having just watched regional politicians embrace a fully elevated, grade-separated line, Broesamle said the coalition will invite them to take another step — by delivering a tunnel to make the light-rail system even more reliable.